Twin Peaks menu prices at your fingertips. 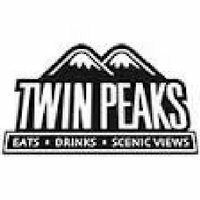 Twin Peaks is an American sports bar restaurant chain serving generous amounts of comfort food favorites like burgers, sandwiches and main dishes like steak and chicken plates. All served by friendly and attentive ‘Twin Peaks Girls’. The interior theme is a combination of wilderness lodge and ultimate man cave. Cold beer is always on tap along with plenty of TVs to catch the live game. This is THE place for guys to hang-out! No one gets left out at Twin Peaks, ladies and kids are always welcome. Below are the latest Twin Peaks prices. What a concept! This is the perfect gift for the man in your life. A Twin Peaks Man Card lets him know that you really love him. What’s not to love. Freshly prepared favorites, cold beer plus the Twin Peaks Girls. Life is good! Order your Man Cards online and have them delivered directly to the recipient via postal service. Stay up-to-date with all things Twin Peaks by joining the Friends of the Peaks Email Club. Just for signing up, Twin Peaks will give you a free chips & queso offer. By being a member, guests will regularly receive special offers, information on sports and special events and details on new items and promotions. To top it all off, members will receive a free meal for their birthday. Sign-up is quick and free. Make your friends and neighbors envious by strutting around with the latest Twin Peaks t-shirts and caps. Be sure to get the latest Twin Peaks Girls calendar to hang up in the garage or office. Ladies apparel is also available. Check out the Shop page on the official Twin Peaks website. With the continued expansion of the Twin Peaks concept, there are plenty of opportunities for candidates to secure a position. Energetic, self-motivated, and hard-working individuals are encouraged to apply for management, corporate support or restaurant opportunities. For those aspiring to be a ‘Twin Peaks’ girl, get ready for an audition! To learn about current openings or to apply for a specific job, visit the official Career page on the Twin Peaks website. Twin Peaks Girls audition locations can also be found online. Twin Peaks was started by Randy DeWitt & Scott Gordon in 2005 in Lewisville, Texas. The Twin Peaks restaurant concept has proved popular and is experiencing growth within the industry. Today, Twin Peaks is privately owned and is headquartered in Addison, Texas. There are over 60 locations across the U.S.
For more information about Twin Peaks, please visit their website.